DAYTONA BEACH, Fla. – It’s finally here. Here’s a closer look at the 47-car field on the entry list. · There are a total of 11 DPi cars, four LMP2 entries, nine GTLM entries and 23 entered in GTD. The field includes cars from 13 different manufacturers led by Cadillac (6 DPi) and Porsche (2 GTLM and 4 GTD) with six entries each. Lamborghini has five GTD entries, Acura (2 DPi, 2 GTD) and Ferrari (1 GTLM, 3 GTD) and Audi (4 GTD) have four entries each, with three BMWs (2 GTLM, 1 GTD) and two each from Mazda (2 DPi), Chevrolet (2 GTLM), Ford (2 GTLM), Lexus (2 GTD) and Mercedes-AMG (2 GTD). Nissan has one DPi entry. · No. 44 Magnus Racing Lamborghini Huracán GT3 driver Andy Lally has the most Rolex 24 At Daytona wins of any driver in the field with five (all class wins – SRPII 2001; GT – 2009, 2011, 2012; GTD – 2016). He is tied for second on the all-time Daytona winners list with three other drivers: Peter Gregg, Hurley Haywood and Bob Wollek. 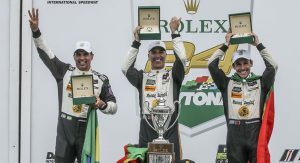 Scott Pruett, the 2019 Rolex 24 At Daytona grand marshal, is the winningest driver in the Rolex 24 with 10 class victories. · Three drivers come into this year’s Rolex 24 with three career overall victories in the race: No. 5 Mustang Sampling Cadillac DPi-V.R co-drivers Joao Barbosa (2010, 2014, 2018) and Christian Fittipaldi (2004, 2014, 2018) and No. 6 Acura Team Penske Acura DPi driver Juan Pablo Montoya (2007, 2008, 2013). As participants in the DPi class, all three have an opportunity to pick up their fourth and move to within one of the record of five overall wins shared by Pruett and Haywood. · There are a total of 51 previous Rolex 24 winners on the entry list. Twenty-seven of the 47 cars have at least one former winner in its driver lineup, including 10 of the 11 DPi entries. Only the No. 50 Juncos Racing Cadillac DPi-V.R does not have a previous winner among co-drivers Will Owen, Rene Binder, Agustin Canapino and Kyle Kaiser. 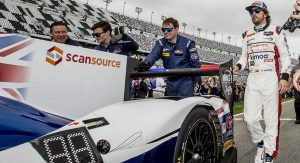 Owen is the team’s only driver with a previous Rolex 24 start, which came in 2018. · Ford Chip Ganassi Racing has the most Rolex 24 wins in the field with eight, including each of the past two years in the GTLM class. The team’s other six – all overall victories – came in 2006, 2007, 2008, 2011, 2013 and 2015. There are a total of 14 teams in the field with at least one Rolex 24 victory. · Porsche is far and away the winningest manufacturer in Rolex 24 history, with a total of 69 victories (22 overall, 47 class) since the race’s inception in 1962. Mazda is second on the list with 22 victories, all of them class victories. A Mazda overall victory in 2019 would be the manufacturer’s first overall win in the race. 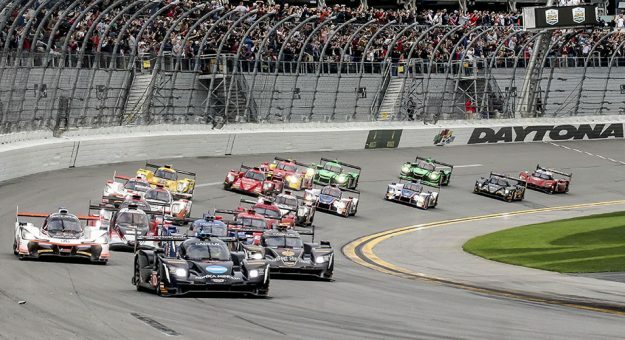 · The 2019 Rolex 24 field includes 40 drivers with one or more top-level IMSA championships, 33 drivers with at least one victory in the 24 Hours of Le Mans, five IndyCar/Champ Car Champions, four Indianapolis 500 winners, three drivers with Formula 1 Grand Prix race victories, two Monster Energy NASCAR Cup Series race winners and one Formula 1 World Champion.